You’ve got a nice refrigerator in the kitchen. The only problem is that you can’t store your beer in there because of important things, like vegetables, take a priority. 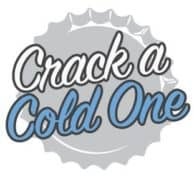 You could stick a bottle or can of beer in the freezer when the need to crack a cold one open comes around. There is a better solution: the best beer fridge for your home. A mini fridge is perfect for the man cave. It works well in the garage. With a little ingenuity, you can place one almost anywhere. It’s a good call. You should get one. Now let’s make sure you can find the best beer fridge to meet your specific needs today. A mini fridge doesn’t need to be super fancy. As long as it plugs into a standard outlet, gets and keeps your beer cold, and does so without looking like a major eyesore, then you’re #winning. From the basic models to the super-premium options, here are the top-rated beer refrigerators that are available right now. A beer fridge is going to free up space in your primary refrigerator for sure. Can’t have enough carrots and celery in there, right? It will also make your beer become more convenient. Let’s be honest for a moment. You’re more likely to grab a beer and crack it open when it is within reach. If you need to walk to the kitchen to grab one, you’ll ask one of the kids to do it for you. Or you could ask your dog. And if no options are available, it’s easier to choose no beer than to hurry over to grab one during a commercial break or a pause in your gaming action. Because the best minibars provide enough room for your cases, cans, and bottles, there’s never a question of space. When the fridge is empty, then it’s time to make a beer run. There is also the added advantage of size. Most beer refrigerators are smaller and can be added to almost any room without difficulty. Throw it under your desk. Sneak it into work if you dare (we don’t advocate drinking on the job, of course), or make it the centerpiece of your own space. Sure. A nice glass door fridge can impress your guests. What matters more is that you make it easier to grab your favorite beer whenever you feel the urge to have one. If there’s one thing that must always be considered when shopping for a brand-new beer fridge, it’s location, location, location. Is your fridge going to be in its own cabinet? Do you need a fridge that can stand on its own? Are you going to need a lock on your fridge to stop others from swiping your favorite brew? For those who are looking for a freestanding appliance, it is necessary to maintain at least 3 inches of top and side clearance, along with 5 inches of rear clearance, to ensure proper functionality. That means you’ll need to grab that old measuring tape from your toolbox and get exact dimensions for the space your fridge will be. Then compare those dimensions to the specifications found in the reviews and descriptions to ensure you’re buying the right size fridge. Nothing is more frustrating than having a great beer fridge that won’t work in its space. And, if you listen closely in such a circumstance, you may be able to hear your favorite beer crying too. 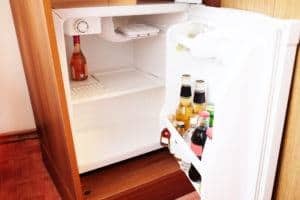 Here are some other aspects of minibar fridge shopping that you’ll want to take into account before you finalize your purchase. An outdoor fridge has different requirements than an indoor appliance. Outdoor models need triple-pane glass, a stainless-steel exterior, and weather-resistant lines and cords so you can have cold beer all year. Would you rather spend $100 on a novelty fridge that can hold 6 cans of beer? Or would you rather spend $100 on a utilitarian design that can only 60 cans of beer? Always look at the capacity before making a final decision. Some refrigerator options can hold over 150 cans, while others use a USB connector to keep 3-6 cans cold. Think about how much beer you drink and go from there. Value shopping is a necessity when looking for a new small or mini fridge. Certain features, such as digital temperature controls or dual-zone climatology, will kick up the price of the unit by quite a bit. It’s a good idea to invest in a safety lock, but otherwise, you may want to limit features if your budget is a little tight. Some models are just 15 inches wide and perfect for slim installation points. A standard mini fridge that fits into a cabinet will be 24 inches wide. Freestanding units can have any dimensions. Match each key point to your existing space, compare it to the best models, and you’ll be able to find the right way to keep your beer frosty cold. 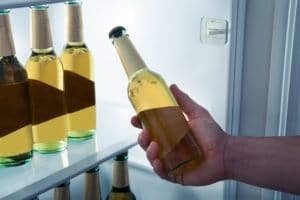 What Are the Best Beer Fridge Brands? There are 5 primary manufacturers that offer beer refrigerators today. Each makes a good product and could be a worthy addition to your living space. Avanti: This brand has more than 40 years of experience and they focus on manufacturing countertop, compact, and specialty household appliances. Danby: This brand is the largest in North America in terms of specialty and compact appliances. You’ll find Energy Star rated models are abundant with this brand and the pricing is extremely competitive. Edgestar: This industry leader manufactures appliances that are on the cutting edge of feature development. You’ll find high-quality options that are supported by world-class customer service with this brand. Marvel: If you want a beer refrigerator that will be a solid performer, then be sure to look at the available options from this brand. Summit: This brand has focused more on medical and commercial refrigerators and freezers over the years, but that experience also means that they make one fantastic beer fridge. Their models tend to be on the upper end of the pricing spectrum, but their consistency in performance is often worth the investment. There are several “generic” brands that are available today when shopping for a mini bar fridge. Some are different brand names that are associated with these Top 5 manufacturers. Others are start-ups, imports, or specialty companies that focus on creating innovative and customized products. There are some great values that can be found when shopping in the generic market. There are also some Edsels that you’ll discover along the way. That is where the best beer fridge reviews come into play. Pay close attention to fridge trial reports and public consumer reviews, but make sure those reviews are verified and the trial reports are authentic. What Features Should the Best Beer Fridge Have? If you want a good beer fridge, then it should have enough space to store your beer and keep it cold. For many, that’s the only feature that is required. 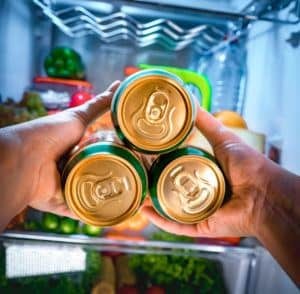 There are some benefits to having upgraded features with a beer fridge, however, because it can make your life a little easier. Here are some of the top features to look at as you shop. Removable Shelves. Beer can come in many different shapes. Maybe you want to try the new IPA and it’s only available in a 40. Or maybe you’ve been given a 64-ounce growler. Or maybe you have a case of cans to put somewhere. With removable or customizable shelving, you can store all of the above, at the same time, in your new beer fridge. Smoked Glass. Light is the enemy of beer. It will change the body and flavor of it very rapidly. Look for a beer fridge with smoked glass or a solid door for best results unless you plan to keep your beer in the deep, dark basement. Dual Zone Cooling. This option is nice if you like to stock two different types of beer at the same time. If you have one beer that likes to be cold and another that prefers to be a little warmer, this feature will help you maintain the right temps at the right time for both beer options. 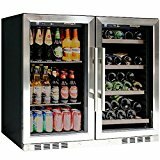 You can buy a nice and compact entry-level beer fridge for less than $100, but you won’t have much capacity. Entry-level models typically store 12 cans or less. For a solid performer, expect to pay at least $250. Premium models can run as high as $2,000. If you’re looking for commercial quality, add another 25% to those figures. 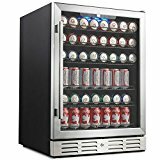 For the average home, a beer fridge in the $300-$500 range will take care of most needs and be backed by a solid warranty and awesome customer service. This 24-inch unit can hold up to 175 cans. You can install it as a freestanding unit or have it built into a cabinet position. That’s impressive, considering the size is just 23 inches by 24 inches. It does have a transparent glass front, so it’s better for canned beer instead of bottled beer, but you’ll still have plenty of space. We also loved the temperature memory function so you don’t have to worry about resetting the appliance if you happen to lose power at your home. It’s an awesome appliance that we think you’re going to love. This is a good option for a beer fridge if you’re looking for more of the traditional experience. 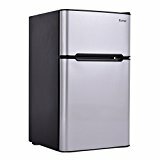 It’s built like a mini fridge and even includes a compact freezer compartment. With 3.2 cubic feet of interior space, you’ll be able to store cans, bottles, and more without any difficulty. Integrated door shelving gives you space for taller bottles and cans as well. With a stainless-steel finish and an Energy Star compliant design, there’s a lot to love about this affordable little refrigerator. If space is a concern for your need to store beer, then we fell in love with this little orange masterpiece. It’s a mini fridge with just 1.6 cubic feet of space, but the door basket has enough room to store a 2L bottle. You’ve also got an ice cube chamber with a tray for instantly cold items. It has a flush-back design that saves you extra space as well. Perfect for the man cave, a garage entertainment space, or a beer fridge next to your favorite recliner. Don’t miss this one: it’s an affordable option for a cold beer like none other. Although this beer fridge has a limited capacity at 90 cans, it provides a better consistency to the temperature output. The transparent glass door is trimmed with stainless steel, backed by a white exterior, which has nice optics for almost any space. Temperature controls go from 30F to 65F, so you can support virtually any style of beer at the optimal temperature. LED lighting in the interior is included and it comes with a cylinder lock and 2 keys. You won’t need to worry about someone coming in to steal your beer with this fridge around. This is another classic fridge option that is more of the traditional design instead of the modern can/bottle design. It offers 4.4 cubic feet of space, so you can keep plenty of beer in here for the big game. Glass shelves instead of wire shelves are included and that makes for easier cleaning. The top of the fridge is scratch-resistant, so it’s a nice place to pour a pint. The door lock is effective and the black interior, with the white LED lighting, makes your beer selection pop. Give this one a go and we think you’ll be extremely pleased. Beer is king, but wine is pretty good too. Many beer fridge options force you to choose cans or bottles of beer over a nice bottle of wine, but not this one. There is plenty of space available to store soda in this fridge as well. With a dual zone temperature design and full control over the climate output, you can store red wine, white wine, and lagers at their preferred temperature. The doors are constructed with safety glass, outlined with stainless-steel trim, and the shelves are fully adjustable to meet your needs. Easily one of the best investment options in the category. This fridge gives you a unique twist. Not only does it act as a cooler with its portable thermoelectric system, but it can also act as a warmer. All you need to do is flip a switch and you can warm up your beverages if you prefer. 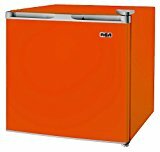 This fridge comes in four different colors and can operate on a DC system. Plug it into your vehicle with the 6.5-foot cable and you can have cold drinks at the ready for your next road trip… or keep it at home with the AC connection to have cold beers at the ready. At this price, with those options, it’s difficult to ignore the value being offered. 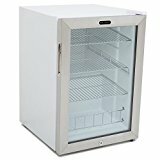 This compact refrigerator and freezer might be designed for the dorm, but it’s the perfect addition to any recreational space as well. It offers a full-width glass shelf, two door shelves, and an adjustable thermostat control so you can get your beer at the right temperature. It offers a space-saving design, a reversible door, and a 1-year warranty in addition to its Energy Star certification to maximize your value. Three color options are available and it installs almost anywhere. Don’t think twice because this is one nice price. If you’re looking for a larger refrigerator with more of a retro look, then you can’t go wrong with this model. Unlike other models of this type, you can actually remove the freezer so the entire space can be used as a fridge. It may not be lockable, but the shelves on the door are detachable and it’s the quietest refrigerator out of the bunch. It gets the basics right and that’s about all one can ask for when looking for the best beer fridge around. 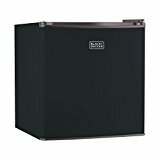 This 2-door compact refrigerator/freezer combination offers 3.2 cubic feet of total space. The temperature range goes up to 50F, while the freezer can handle temps as low as 5F. It is a combination of stainless steel, glass, and plastic, so it provides the traditional user experience. It is designed to be a freestanding appliance, though it could be installed into custom cabinetry if desired. It’s easy to use, is of good quality, and we found it to be an amazing value. A minibar fridge does more than keep your favorite beverage cold. It brings people together. It encourages you to have a great time. It enhances life. Now go get the one that will help you enjoy all those benefits right now.